One good thing about getting older is that some businesses are very kind to us seniors and will give us discounts. I use my old age status to get a break anywhere I can. If I see a sign in a storefront or at a ticket window about senior discounts, I will definitely ask if I qualify. And sometimes I won't even ask and I will get the discount which makes me feel really old until I convince myself that the cashiers assume I am old enough because I am with Soko who won't dye his gray hair! But some places don't have any signage or anyone there that will offer that information so I decided to research to find the best places to get discounts, especially for travel discounts. l. Hotel Discount - AARP - You can get 5% - 15% off your hotel stay at some hotels if you mention AARP. I have my card on my iphone so it's always with me because the hotel clerk will sometimes ask to see it when you are checking in. If you don't have an AARP membership, check to see if the hotel has a senior rate. Good to know: Sign up for hotel rewards cards as long as they don't cost anything. We have the IHG card which I know we will never be able to use to get a free room but when we check into a Hilton we are greeted very nicely and we have been given complimentary water bottles. Also, because we signed up for a card, we are on their email list and once found out that they were having a special sale that ran during the time we had a hotel booked. Soko called and asked for the special sale price which was about $20 less than we were paying and got it! 2. Travel Discount - Southwest and a few other airlines offer senior discounts of usually 10%. Sometimes their "best rate" discount is better than the senior rate though. If you rather stay on the ground when you need to get somewhere, Amtrak gives seniors who are 62+ a 15% discount on select destinations. If you prefer taking a bus, Greyhound offers seniors 62+ a 5% discount on their unrestricted passenger fares. Good to know: You may be able to get a full refund on your senior ticket if you have to cancel your airline reservation. Read the fine print or call the airline to make sure of the airline's policies. 3. Car Rentals - Almost all of the big car rental companies offer discounts for seniors. Some consider age 50 to be eligible and some consider age 60. Good to know: Budget offers a 10% discount to seniors but you may be able to get up to a 30% discount if you go through AARP. 4. Restaurants - There are many, many restaurants that have senior discounts. Age requirements start from 50 if you are dining at a restaurant that accepts an AARP card. Most discounts are 10%. I like being able to choose a meal from the senior menu that some restaurants offer, Perkins for one, because not only is there a discount but the portion is smaller. Good to know: AARP members can get a free donut when they purchase a large or XL coffee at Dunkin' Donuts. 5. National Parks - America the Beautiful - National Parks and Federal Recreational Lands Pass - Annual. $80.00 for a senior (62 and older) lifetime pass. Good to know: Admits the vehicle of the pass holder and their passengers into parks that have vehicle entry fees and/or admits the pass holder and 3 adults into per person fee areas. 6. Local Discount Cards - Check to see if your state and then your city is a participant in the Senior Citizen Discount Card program. Some of your local businesses offer discounts with this card. You have to be at least 60 to get a one. I have used it to get a 10% discount at a restaurant in downtown Wilmington, NC near where I live. 7. Entertainment - Discounts and age requirements vary from theater to theater but you can get a discount at many movie theaters, if not all. Also check for discounts at the museums near you for any discount. The New York Museum of Modern Art and the Art Institute of Chicago both offer discounts. Also, like the NY Yankees, your favorite baseball team may offer you a discount if you are old enough! Good to know: If you are a snowbird like I am and your winter home is Florida, Busch Gardens Tampa and Sea World Orlando offer a $3.00 discount on a one-day ticket to seniors 50+. 8. Grocery Stores - If you have a Harris Teeter in your neighborhood like we do, and you are over 60, you can receive a 5% discount on Thursdays. Check your local Piggly Wiggly, Pathmark, Meijer, Hy-Vee, Hannaford, C-Town, Albertsons, Publix, Bi-Lo, Kroger and ShopRite. 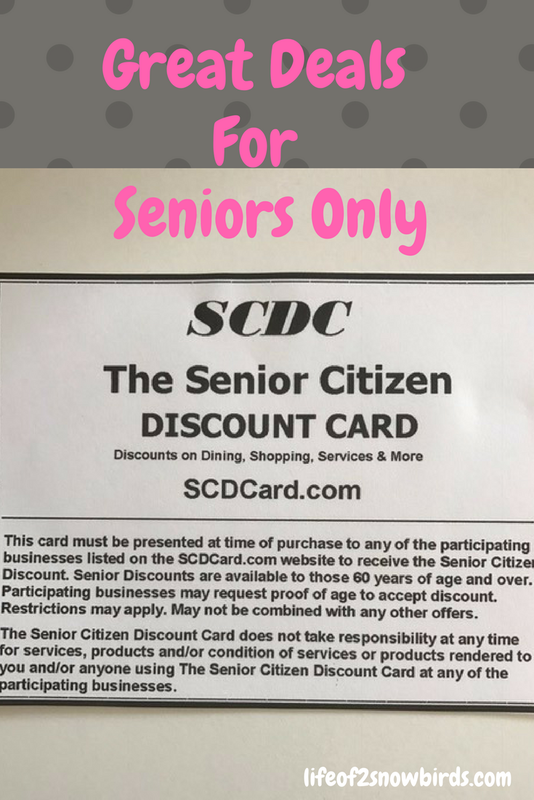 These stores offer senior discounts but sometimes it is the decision of the particular store to offer the discount or not. 9. Retail Stores - Bealls will give you 15% off your entire purchase on Mondays if you join their Monday Club for seniors 50+. 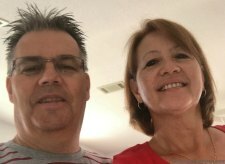 Kohl's gives seniors 60+ a 15% discount on Wednesdays. Michael's gives seniors 10% off their entire purchase everyday and so does Banana Republic. Other retailers that offer discounts are Belk, Bon-Ton, Dress Barn, Lens Crafters (with an AARP card) Ross and Stein Mart. Good to know: You can get 15% off eligible services and products and 5% off domestic and international shipping services at UPS if you have an AARP card. We didn't know that! 10. Car Maintenance Discounts - Jiffy Lube offers 10% off services and parts and Midas and Vavoline offer discounts for seniors but you will have to check at your local shop because not all of their shops participate. I would love to hear from you if you know of discounts anywhere else. Please send us a comment so I can add it to our list! This is great information for us Seniors. I love to travel and eat out, so this is perfect for me. Thanks for sharing on Sunday's Best. What a great list! I know about a few restaurant discounts, but I didn't know about all of these! Thanks so much for sharing at Celebrate it! There are a few good things about getting being a senior! Thank you for sharing with us at Merry Monday. We look forward to seeing you at the party this week!